This thorough and detailed exposition is the result of an intensive month-long course sponsored by the Clay Mathematics Institute. It develops mirror symmetry from both mathematical and physical perspectives. 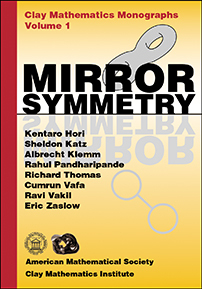 The material will be particularly useful for those wishing to advance their understanding by exploring mirror symmetry at the interface of mathematics and physics. This one-of-a-kind volume offers the first comprehensive exposition on this increasingly active area of study. It is carefully written by leading experts who explain the main concepts without assuming too much prerequisite knowledge. The book is an excellent resource for graduate students and research mathematicians interested in mathematical and theoretical physics. Titles in this series are co-published with the Clay Mathematics Institute (Cambridge, MA). Graduate students and research mathematicians interested in mathematics and mathematical and theoretical physics. This book, a product of the collective efforts of the lecturers at the School organized … by the Clay Mathematics Institute, is a valuable contribution to the continuing intensive collaboration of physicists and mathematicians. It will be of great value to young and mature researchers in both communities interested in this fascinating modern grand unification project.